In large skillet over medium-high heat, cook bacon until browned and crisp. Carefully remove bacon and drain on paper towels. 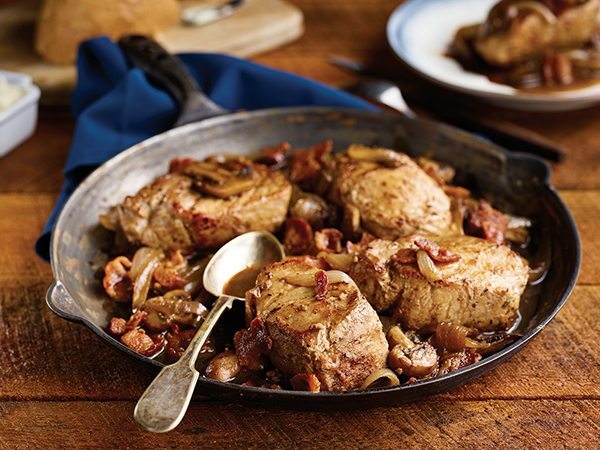 Brown pork chops in bacon grease over medium-high heat, about 2 minutes per side; remove chops from skillet. Add butter to bacon grease in skillet; saute onions, mushrooms, salt and pepper until onions have browned and are tender. Stir in stock, vinegar and garlic; cook and stir until reduced by half. Add browned chops and cooked bacon to skillet. Cover and simmer until internal temperature of meat reaches 150° F, turning once, about 10 minutes. Easily make your favorite cakes and multiple batches of cookie dough with the 5-quart stainless steel mixing bowl with comfortable handle that the KitchenAid Artisan Series Mixer has to offer. With 10 speeds, the standmixer will quickly become your kitchen’s culinary center as you mix, knead and whip ingredients with ease. And for even more versatility, the power hub fits optional attachments from food grinders to pasta makers and more.